USC Spatial students have extensive opportunities to work directly with faculty on their funded research projects. 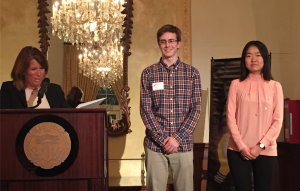 Read about some of the awards and recognition that our students have received for their scholarship and about research and internship experiences of two GeoDesign majors. Applications are now being accepted for undergraduate research opportunities with USC Spatial faculty in the 2018-2019 academic year. Applications are due to Managing Director Susan Kamei by 5:00 pm on Tuesday, July 31, 2018. 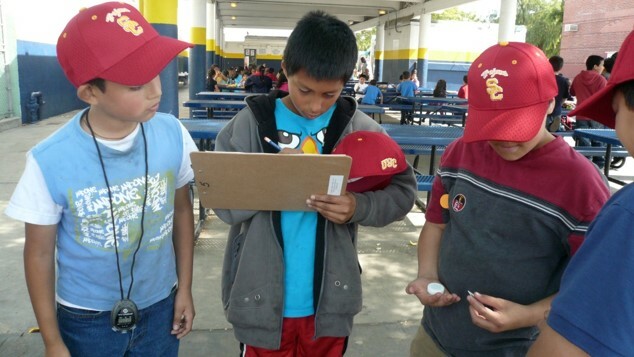 The USC and the Keck School of Medicine “SunSmart” outreach program seeks to improve sun exposure behaviors among children and adolescents in USC-affiliated schools to reduce risk of skin cancers, particularly melanoma. In the 2016-2017 SunSmart Undergraduate Research Associates Program (URAP) project, Diana Kim (B.S. GeoDesign '17) and Nida Soe (B.S. GeoDesign '17) worked with elementary school students to collect UV data, create a geodatabase, conduct spatial interpolation of the UVI, analyze the solar radiation, and identify potential locations for and types of shade structure most desired by the students. They worked with the SSI and Keck faculty team of Dr. Myles Cockburn, Dr. Kim Miller, Marlene Caldera, Dr. Loraine Escobedo, Dr. Jennifer Swift, and Dr. Darren Ruddell. 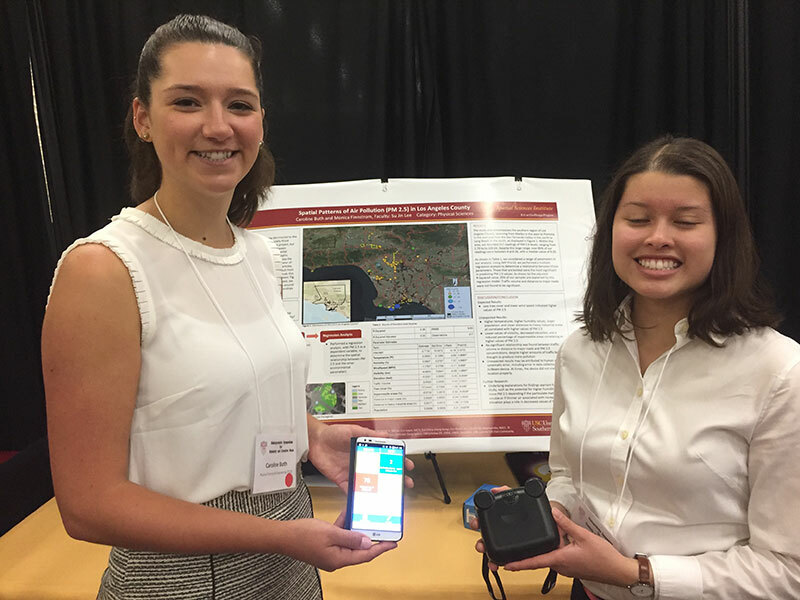 They presented their research results at the 2017 American Association of Geographers (AAG) Annual Meeting in Boston, MA and at the 2017 USC Undergraduate Symposium for Scholarly and Creative Work. In the 2017-2018 academic year, the Phase 2 URAP project implemented SunSmart strategies to provide safer and healthier schoolyards for students and educators. Research activities included utilizing the previous URAP SunSmart data gathered, analyzed and mapped, use of Geographic Information Science (GIS) technology to support design, planning and project management activities, and faculty/student-led workshops aimed at executing schoolyard SunSmart GeoDesigns. • produced a final presentation for each of the three participating schools, and for all stakeholders tofurther educate children in tangible solutions and to illustrate to the school boards and PTSA’s the concrete steps taken to solve the problem. The research culminated in a three-day workshop at which the GeoDesign students presented their alternative plans for implementing specific design scenarios aimed at reducing sun exposure among children at the five partner schools. The students, as a team, produced the project management plans and final results of the designs implemented in the real world, including presentations at schools and for other stakeholders as needed, and prepared a final technical report on the methodology and results of this summer project. This report detailed information about the final designs chosen for each school, implementation plans including construction management schedules, costs and funding sources identified and/or obtained, and PDF’s of any final presentations. Under the direction of SSI Director and Professor John P. Wilson and SSI GIS Project Specialist Beau MacDonald, a team of SSI undergraduate and graduate student researchers developed a state-of-the-art 3D visualization of the University Park campus (UPC) for the USC Facilities Management Services (FMS) that includes buildings and landscape features. With this 3D model, FMS can generate real-time interior and exterior routes for emergency responder, disability access, strategic planning, and other essential services. Team members created models for various landscape elements on the UPC campus, including fountains, statues, fences, gates, trees and other vegetation. For example, after drawing the footprints for fountains using a satellite base map in ArcMap, they collected data in the field, gathering more-accurate location information, taking photos, measuring heights and other attributes. The actual 3D models were made by importing shapefile or geodatabase geometry into CityEngine software and then writing procedural cga code to generate the models. 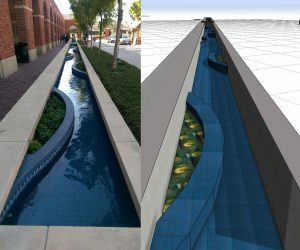 Final steps included importing realistic water and façade textures and then using additional 3D software to develop intricate shapes and decorations and to create some of the statutes for the middle of the fountains. The 2017-2018 team melded together all the components of the virtual campus environment -- buildings, fountains, trees, and other elements -- using the newest technology to make the models available online. The team has included undergraduates Elizabeth Berson, Grace Corsi, Courtney Fassett, Robin Franke, Julia Fruithandler, Eliza Gutierrez-Dewar, Diana Kim, Sarah Ladhani, Leo Ngo, Teddy Park, Joanna Wang, and graduate students Nandan Nayak and Yuqing Qian. Research participation was funded by the Provost’s USC Undergraduate Research Associates (URAP) Program and the USC Dornsife Student Opportunities for Academic Research (SOAR) Program. The US National Park Service has recognized preservation of the night skies as an important purpose of the park system. Information about the levels of light pollution as it might affect wildlife, the human experience, and astronomical observations across all park units is currently lacking, notwithstanding excellent baseline surveys of many parks. Ben Banet (Interdisciplinary Studies '18) and Shan Yu Chuan (Spatial Sciences minor '17) worked with Dr. Travis Longcore, Assistant Professor of Architecture, Spatial Sciences, and Biological Sciences, to describe and track the levels of light visible from space emitted from and around each of the 400+ units of the National Park system using ArcGIS to analyze remote sensing data from the Visible Infrared Imaging Radiometer Suite (VIIRS) Day-Night Band. Ben and Shan developed and carried out a methodology for processing the VIIRS data. They are gathering the necessary data such as VIIRS datasets and the National Park shapefiles. Once the methodology is finalized, they will process the data to identify how much light pollution is in and around each park and categorize the parks by similarities in the types and distribution of light pollution. For this research, Ben and Shan won the second place prize from the USC Schwarzenegger Institute for State and Global Policy and honorable mention in the 2016 USC Undergraduate Symposium for Scholarly and Creative Work. Ben’s research participation was funded by the USC Dornsife Student Opportunities for Academic Research (SOAR) Program. In the 2017-2018 academic year, the team developed detailed reports showing trends in light pollution,documenting conditions at various known locations and identifying species likely to be sensitive to light pollution within each park. Dr. Yao-Yi Chiang, Associate Professor (Research) of Spatial Sciences, is pioneering novel technologies to automatically converting labels and graphic symbols in scanned historical maps into a usable format in a Geographic Information System (GIS). Labels and graphic symbols in maps depict important and interesting geographic phenomena, such as historical records of land use. Historical maps are an especially important source of this information for which limited alternative sources exist. Traditional techniques for automatic map processing require a significant amount of training datasets, the presence of map keys, or ad-hoc preprocessing steps (e.g., image thresholding). 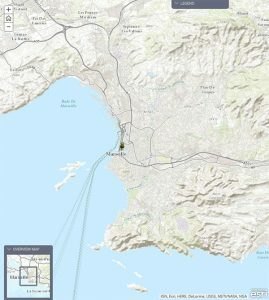 This project deals with the challenges in building automatic tools that require only a few training samples for recognizing cartographic symbols from scanned historical maps. The outcome of this project will be an open-source map-processing tool that eliminates the need for tedious, time-consuming manual work for map digitization. Also, this project will produce a set of training materials and sample datasets that, together with the tool, can be used by researchers in various fields such as in the spatial, social, environmental, and health sciences, to obtain useful geographic information in the past. As a result of their research with Dr. Chiang, the paper “Recognizing Text On Historical Maps Using Maps From Multiple Time Periods” by URAP student researchers Ronald Yu and Zexuan Luo was accepted to the International Conference on Pattern Recognition, December 4 - 8, 2016, in Cancun, Mexico. Dr. Chiang's research group also has worked with the Visual History Archive (VHA) in the USC Shoah Foundation contains a large digital life story collection of survivors before, during, and after the Holocaust, Rwandan, Nanjing, and other genocides. Currently, location information (e.g., place names) mentioned in the VHA is indexed by keywords. For example, “Poland” as the keyword for place search on the VHA online archive returns 5,325 indexing terms in which the indexing terms (place names) with verified locations are displayed in a Google Maps web interface. Since place names and administration boundaries can change significantly over time, displaying search results on a current map would not provide the best visualization tool for navigating the VHA digital collection through space and time. In addition, a number places mentioned (indexed) in the testimony could not be located due to the lack of historical sources for verifying the location information of these places. This limits the opportunity for researchers, educators, and the general public to access valuable VHA materials and prevents the VHA collection from being indexed and searched by advanced spatial queries (e.g., finding the testimonies mentioned cities or towns in Poland between 1930 and 1945). The GeoDesign majors on this research team -- Alex Chen, Robin Franke, and Leo Ngo -- have used the Esri Story map program to tell these survivor's experiences from information mined from the archives, maps, and other materials to “go back in time” to recreate the physical world of the survivor’s historical experience. In 2016-2017, a team under the direction of Dr. John P. Wilson, Professor of Sociology and Spatial Sciences, Dr. Noli Brazil, SSI Post-Doctoral Research Associate, and Beau MacDonald, SSI GIS Project Specialist, used Los Angeles Police Department crime data from 2012 to 2016 in the City's GeoHub portal to determine street segments of high and increasing crime with the City of Los Angeles. Under this joint initiative of the Office of the Mayor of Los Angeles and SSI, this SSI team spatially analyzed crime trends to help inform public safety initiatives. The team utilized open data and comparisons over time and produced a GIS crime mapping application as a basis for finding further correlations to other city services. The team found that macro analyses at the police division level or block group level hide significant clustering at more local levels, providing support for the recommendation that crime prevention and deterrence strategies in micro places should be multiscalar and should target both built and social characteristics and take into account the temporal variation in determinants of crime. The City of Los Angeles will continue to analyze crime at a street segment level and incorporate more data layers from various departments to encourage understanding and cooperation between City departments. The SSI student team members were Izzy Mitchell, Richard Windisch, Kyra Schoonover, Robin Franke, Leo Ngo and Yuqing Qian. The students were funded by a generous donation from Esri, which was a partner with the City of Los Angeles in constructing the GeoHub portal. Read more about this project. The Global Cancer Solution project was created in 2014 to find public health initiatives, identify local stakeholders, and adopt culturally appropriate strategies to increase surveillance coverage in developing countries. Under the direction of SSI faculty affiliates Dr. Laura Ferguson and Dr. Myles Cockburn and SSI post-doctoral research associate Dr. Loraine Escobedo, Riley Ransom (Health Promotion and Disease Prevention major) updated the data for a project that identifies global initiatives that may be utilized to improve or start population-based cancer surveillance in developing countries. Her Story Map showcases the intersection between spatial sciences, global health, and cancer prevention and control. 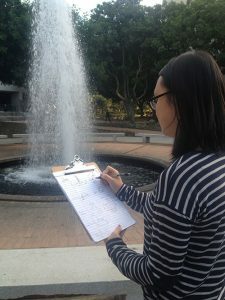 In 2016-2017, Spatial Studies minors Caroline Buth and Monica Finnstrom worked with SSI Professor Su Jin Lee to analyze the distribution of concentrations of Particulate Matter (PM) 2.5 in Los Angeles County to establish what environmental parameters affect these values. Using ArcMap and new technology that included a portable sensor, AirBeam, the undergraduate researchers used the data collected and crowdsourced data to digitize land cover within 50-meter buffers around the documented readings on a base-map, and then calculated the land cover percentage. They then performed a standard least squares regression analysis to determine which parameters might be statistically significant in predicting PM 2.5 values. They concluded that the significant parameters are temperature, humidity, wind speed, visibility, elevation, tree cover, impermeable areas, and population. In 2017-2018, this team visualized the consequences of the impact on land cover changes in Los Angeles County, built a model to classify land use by types using a GIS system; extracted property information and spatially join them with the classified parcel boundaries using a GIS system; identified approved community, neighborhood, and area plans; and analyzed data to explore a spatial pattern or relationship between the parcels and plans. Professor Matthew E. Kahn, USC Professor of Economics and Spatial Sciences, is researching the spatial aspects of adapting to climate change and the specific risks that different cities in the United States and around the world will face. In particular, Dr. Kahn is focusing on how China’s urban development patterns are impacting local and global environmental challenges. His book with Siqi Zheng entitled Blue Skies over Beijing: Economic Growth and the Environment in China was published by Princeton University Press in May 2016. GeoDesign major Ziyu Ouyang’s research participation with Dr. Kahn was funded by the USC Dornsife Student Opportunities for Academic Research (SOAR) Program. Current place-based methodologies focus upon the social behavior of individuals in response to loss (such as unemployment, foreclosure, eviction, and incarceration), leading to results which focus on the behavior of individual residents in reaction to these social stresses. An understudied area is the role of place as a source of stress and an aggregator of individual experiences. Professors Jochen Albrecht and Mimi Abramovitz of City University of New York (CUNY) Hunter College have developed two new GIS-based indices which capture chronic exposure by neighborhood residents to multiple resource losses at the same time. Using maps, they analyzed the spatial distribution of six types of loss in New York City neighborhoods and the characteristics of the residents who live in high- and low-loss neighborhoods (such as health, housing, education, income, food, educational and other insecurities). The potential of this new form of analysis is to develop more finely-calibrated social services and interventions based upon actual community need. 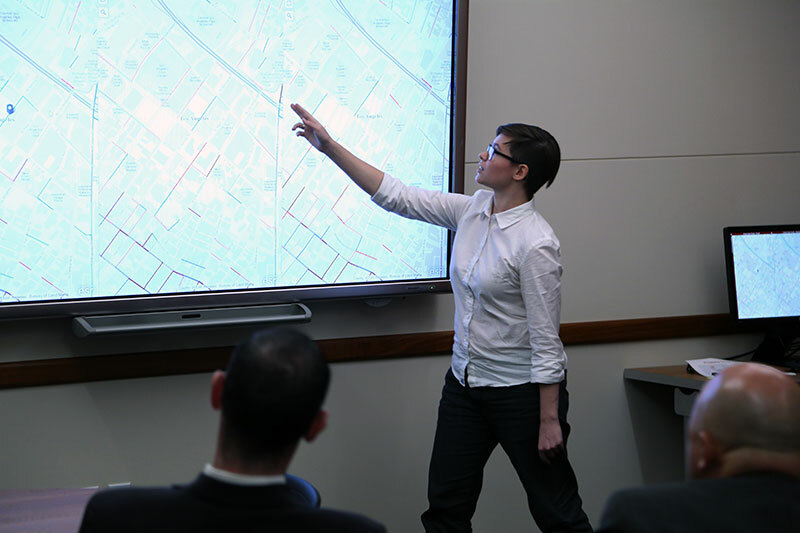 Under the direction of Professor John P. Wilson, GeoDesign major Alex Chen developed a test case in which he applied the Hunter College “Community Loss” and “Neighborhood Risks” indices to a Los Angeles regional community. Alex first identified and procured available and commensurate sources of data to use in this model, correlating the loss variables with unit of measurement (e.g., at the ZIP code level), the level of spatial resolution, and data source. Alex’s research participation was funded by the USC Dornsife Student Opportunities for Academic Research (SOAR) Program. The Spatial Sciences Institute will offer SSCI 350: International GeoDesign from May 28 through June 28 in the summer of 2019, during which students will conduct research with international GeoDesign experts in Amsterdam, Rotterdam, Delft, and Los Angeles. Students will apply Dutch urban planning, geospatial technologies, and environmental design principles to address an LA-area societal challenge of their choice. During the two-week field experience based at Vrije University Amsterdam from June 8 through June 22, 2019, students will participate in a GeoDesign case study to create urban renewal projects in Amsterdam-Zuidoost (South East) with Dutch GeoDesign practitioners and faculty from Vrije University Amsterdam and USC. Students also will have the opportunity to collaborate with Dutch students in a state-of-the-art geodesign lab. Applications are due to Professor Laura Loyola (loyola@usc.edu) in February 2019. Space is limited. Apply now to be join the research teams of the Spatial Sciences Institute faculty with funding from the Provost’s USC Undergraduate Research Associates (URAP) Program for the 2018-2019 academic year. The SOAR program provides funding to Dornsife majors for participation as a research assistant in a faculty member’s project. The purpose of SOAR is to connect students with faculty members and their research; it allows all students to be mentored one-on-one by USC faculty, and introduces students early in their academic careers to the process of serious scholarly inquiry. Please note that this program does not fund independent research projects, including those related to 490 courses or honors theses. SOAR is for research during the fall and spring semesters of the academic year. Funding applications are accepted for the first five weeks of fall and the first four weeks of spring semester. Please check the USC Dornsife Student Opportunities for Academic Research (SOAR) Program website for application deadlines for AY 2017-2018. The Dornsife SURF Program provides funding to USC Dornsife majors to pursue undergraduate research, in collaboration with Dornsife faculty, either on or off campus during the summer semester. Students are encouraged to conduct on-site research either at USC or under the direction of USC Dornsife faculty at many institutions across the nation and around the globe. Any student in good standing, with at least one USC Dornsife major, may apply for a research stipend of up to $3,000 to support a summer research project of their choosing. This stipend may be used to pay for travel, equipment, living expenses, fees, or other costs related to the research effort. Students participating in the Spatial Sciences Institute SSCI 350: International GeoDesign "Problems Without Passports" research course may use SURF funds to offset course tuition. Call the Dornsife Dean’s Office at (213) 740-2531 for more information about eligibility, deadlines, and the application process.